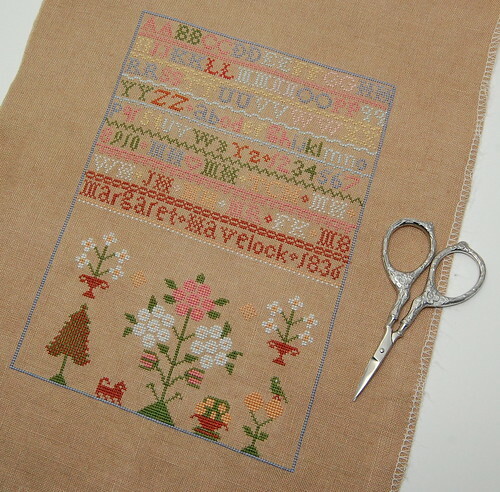 Nicole's Needlework: Margaret Havelock Finished! I finished my first reproduction sampler! Now I'm going to start on my ornament and then get back to Shores! Write soon! That is gorgeous!! Congratulations, Nicole! How exciting!!!! That seemed really fast too!!! I have this magazine ordered as I going to take your lead and stitch it too!!!! Have a good weekend! oh Nicole that turned out great! Love how the sampler turned out! It's so beautiful, Nicole! I love it! It's a beauty - congratulations! Gorgeous finish! You whipped this one out super fast! Kudos on a great finish! Love the bright colors....happy stitching this weekend! you are finished already? lol, great job. That's really your first repro finish? Congrats! It won't be your last, they can be rather addicting. its very pretty! you stitched this one really quick! A stunning finish. Lovely colours. Love this one! Guess I will have to get my hands on a copy. Beautiful, Nicole! And you stitched it so fast too! Beautiful finish Nicole. Congratulations girl!! I love the colors on that one! Congratulations on your first sampler. It is gorgeous. Congratulations! She is quite lovely!! Gorgeous finish, Nicole! I love it! SO beautiful!! Love the colors. Margaret is beautiful Nicole. Congrats on your finish. It's beautiful Nicole. I really like the colors of it! You finished that one quickly!! 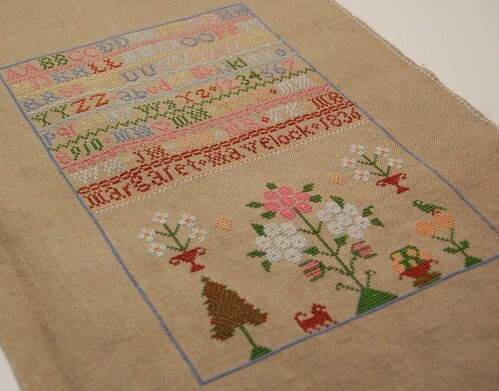 Such a pretty sampler!Congratulations on a beautiful finish. Wow, you stitched Margaret up fast. She is lovely and I bet she won't be your last repro. Congrats! I love how it turned out !! The colors are beautiful... Congratulations on your finish. Wow Nicole, it's so pretty!!!! Congrats on the finish, you are the fastest stitcher ;-). Well done on a gorgeous finish, I especially love the alphabet. Looking forward to seeing your ornie started, the thread colours look lovely. That is beautiful, Nicole - I love the colors. Congratulations on your first reproduction sampler finish! Absolutely gorgeous! I love the colours and it's great to know you can achieve these results with DMC threads! Five days! you did it in five days!! I am totally amazed - and you have been busy with knitting as well. Great finish. I just browsed thru my SANQ back issues today and she was one of the reproduction samplers caught my eyes. Your Margaret is beautiful! !